Q What is the prospect of the meningococcal B vaccine being adopted into the UK immunisation schedule? A There are already vaccines for meningococcus A, in combination with C, Y, W135 serotypes. The meningococcus B vaccine was recently in the news, having been under evaluation by The Joint Committee on Vaccination & Immunisation (JCVI). The vaccine itself is fascinating, having been “reverse engineered” from the genetic sequence of the meningococcus B bacterium. All that said, the JCVI looked at the cost-effectiveness of the vaccine, in both childhood and adolescence, and the decision was that the vaccine would not be cost-effective – at any price. This decision was made having considered the numbers of children who would be vaccinated, then developing fevers requiring a workup for potential sepsis, and the lack of data regarding effectiveness at preventing meningococcal B carriage. The JCVI did add that further data from a population study (adding that the UK would be an ideal base for such a study) might prompt a reconsideration, but currently I can’t see a meningococcus B vaccine entering the UK immunisation schedule. Q What is the natural history of pertussis in young children, and how can we conﬁrm the diagnosis? A Before pertussis vaccination was available, epidemics of pertussis occurred, peaking every 3 years, and mortality was high. Vaccination has led to reductions in severity and mortality; however, pertussis currently affects hundreds of children each month following a sustained outbreak during 2012 which saw a record 9,741 cases. Immunity is not life-long; older adolescents and adults may develop a mild infection (often underdiagnosed, and undertreated) and spread this to children too young to be vaccinated. Vaccination in pregnancy is a strategy to protect infants before they are old enough for active immunisation. Spasmodic (also lasting about 2 weeks). Symptoms include bouts (paroxysms) of coughing causing facial discolouration, a deep inspiration (the “whoop” may well not occur in young infants) and, commonly, vomiting. Between paroxysms, there is often little to find – the child may be afebrile, with clear chest. Convalescent (lasting from 2 weeks to several months). Coughing gradually resolves, but relapses following upper respiratory tract infection may occur. Major complications and deaths occur mostly in infants <6 months old. Such complications may include bronchopneumonia (marked by high temperature and chest signs), cerebral hypoxia and haemorrhage, apnoea, bradycardia and seizures. Diagnosis is primarily clinical, without the need for laboratory confirmation. Whooping cough is a notifiable disease. From a pernasal swab, one can culture pertussis (yields are dramatically reduced following antimicrobial treatment at any time), or perform polymerase chain reaction (PCR) analysis. Culture has a better sensitivity, but it can take up to seven days for the results to be returned. Given the delay in result availability, if you suspect pertussis commence treatment, normally with clarithromycin or erythromycin, and notify. Q What are the most common presenting symptoms of UTI in young children and babies, and when should we consider testing urine in a pyrexial child? A urinary tract infection (UTI) is diagnosed by symptomatic, significant bacteriuria. It is common (10% of girls, and 3% of boys by the age of 16) but can cause systemic symptoms even without any pre-existing abnormality. UTIs present with a number of symptoms, including mild cystitis through to sepsis, as well as growth faltering, electrolyte disturbances, dehydration, fever, vomiting and irritability. UTI is a common differential diagnosis (the prevalence is around 6% of children), so urine sampling should also be a common practice. One can try and distinguish upper from lower UTIs. Lower UTIs (cystitis) cause dysuria, frequency, urgency and incontinence; upper tract infections (pyelonephritis) cause fever, loin pain, vomiting, irritability and sepsis. But in practice, this is often difficult in children < 3 months, and in cases of uncertainty it’s prudent to consider UTI as an upper tract infection, referring to hospital for consideration of intravenous antibiotics. Any child with an unexplained fever >38° or higher should have a urine sample tested within 24 hours. For young children <3 years, the urine is dilute, so the dipstick test is less accurate, and in these cases urine should be sent for microscopy to better diagnose a UTI. Practically, if you are seeing a child three years or younger in whom you are considering a UTI as a diagnosis, the decision will be either to acutely refer the child for work-up of fever with uncertain focus, or to start empirical antibiotics, having sent a urine sample for culture, and then arrange review in a few days to go through the result and assess the need for further investigations/follow-up. Q Is there a role for prophylactic antibiotics in children with recurrent otitis media – and can this be instigated in primary care? A In cases of otitis media, I would always tend to avoid antimicrobials, unless there is a discharge. In the case of recurrently discharging otitis media, then a referral to ENT would be most appropriate. reduce the detrimental effects of antimicrobial resistance secondary to unnecessary use. It is estimated that in developed countries toddlers spend an average of 40-50 days of their life each year for the first 2 years taking antibiotics. Q How can we identify infectious rashes that mandate referral? A With non-blanching rashes, the anxiety is obviously going to be meningococcal disease. That said, the same type of rash can reflect haematological (idiopathic thrombocytopaenic purpura), inflammatory (Henoch Schonlein purpura), traumatic (following vomiting or coughing), or infective causes (including streptococcal throat infections and gastroenteritis, as well as meningococcal disease). It is often very difficult to distinguish these, given the anxiety about missing a serious infection. In primary care I would advise immediate referral. Parenteral penicillin is not necessary in every case and is best reserved for those with any of the following: purpura (>2mm diameter spots), meningism/ bulging fontanelle, lethargy, irritability or progressing rash. Q How do you recognise dehydration during gastroenteritis, and how should we manage childhood gastroenteritis in primary care? A In hospital we use a traffic light scheme to distinguish those who require resuscitation, rehydration, or who are able to be safely managed at home. In primary care, it is those in the latter category that are key. Ensuring that a child is managing fluids can be quite difficult, unless you are able to see the child at either end of a surgery to establish their ability to tolerate fluids. In essence, children whom you will be able to manage in primary care will be those with normal physiology (i.e. normal conscious state, skin colour, heart rate and breathing pattern, warm peripheries and no sunken eyes). The history is important too: although asking about wet nappies in an infant is important, it is often complicated by liquid diarrhoea. Any child, particularly if under 5 years, who is vomiting more than five or six times, or has 10-12 diarrhoeal episodes in a day (and judiciously, a lower number of both if they are combined), probably warrants a period of assessment and confirmation that they can tolerate oral fluids. On my unit we want children to manage 30 mL/ kg of fluid (in practice often Dioralyte, but this could be milk or any non-fizzy fluid containing calories) with less than 3 vomits before we allow the child home. Checking urine for ketones will identify those who are dehydrated, but in practice the clinical pointers are probably a better guide. If you have the luxury of urinalysis, the presence of ketones suggests a degree of dehydration which should prompt a period of observation and assessment, as above. As regards the fluid to use at home, milk is ideal. Essentially, the fluid must contain calories; we are seeing an increasing number of infants with hypoglycaemia secondary to inanition, because the child has been starved or only given cooled, boiled water. A key word of warning is to exercise caution in ascribing a diagnosis of gastroenteritis to a young child with vomiting alone. Vomiting is a very non- specific sign for conditions such as emerging sepsis, so vomiting as the only sign merits healthy respect. Q What do we need to be aware of in children with chickenpox? A Chickenpox is generally a mild infection in children. The key factor is the age of the child. Neonates whose mothers contract chickenpox one week before to one week after birth are at risk of severe, potentially fatal disease and should be given varicella zoster immune globulin (VZIG). Neonates who develop chickenpox within the first four weeks of life should be referred acutely, with the expectation of IV aciclovir treatment. Beyond this age, there is little benefit in giving oral aciclovir, which has very poor oral bioavailability (around 20%). Treatment is directed at symptom control. Infrequently, bacterial superinfection can occur – typically streptococcal, or staphylococcal toxic-shock syndrome. A child with fevers continuing after 3 days of chickenpox appearing, or who is systemically unwell, should be referred acutely to address this possibility. Certain other groups are at risk from exposure to chickenpox, including the immunocompromised, non-immune pregnant women, and non-immune adults. It would be important to advise parents of a child with chickenpox that their child remains contagious until all their spots have crusted (around 5-6 days after onset). Although there are no plans for varicella vaccination routinely in childhood, children aged 1-12 years who are close contacts of one of these groups may be immunised. Q What are key red ﬂags and referral criteria in childhood infections? A By “childhood infections”, I’ll concentrate on the “fever, no focus” group. This is the most useful group, because one is vigilant for occult sepsis. 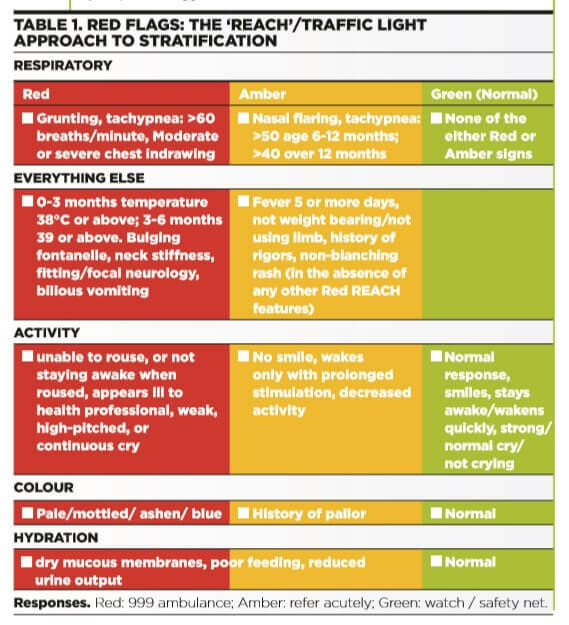 As with gastroenteritis, we use a traffic light scheme to stratify children – mostly those aged under five years, but still applicable to older children: Red: probable serious bacterial infection; Amber: possible serious bacterial infection; Green: improbable serious bacterial infection (see Table). Five categories help you stratify – Respiratory, “ Everything else”, Activity, Colour, Hydration. “REACH” for it in cases of hot children/ fever no focus. Note: Red in any one category or component mandates an emergency response. For example, in the “Everything else” category, a temperature of 38ºC equals requires an urgent response – even without any other Red features.